One of the most ignored areas of the house is probably the floor. While people spend a considerable amount having just the right kind of furniture and décor, they forget that the basis of it all is the right kind of floor. This is because it should be able to blend in with any kind of theme for the house, whether contemporary or traditional. One of the best options for your basic structure of the house is solid real oak flooring. Having a wooden flooring changes the look and feel of your entire house. It will add that artistic look while matching beautifully with your existing furniture. Additionally, it is very functional, too. Oak flooring is cost-effective and user friendly as compared to the other types like expensive Italian marble or ceramic tiles and at the same time, it is a lot more durable. In fact, people are known to use the oak flooring for years. As mentioned earlier, quality of our solid oak flooring range comes in 18mm thickness and with width of 125mm this ensures its durability, whilethe thickness shows its stability and strength. Lastly, don't forget to check the quality of manufacturing. The oak might be of superior types but has it been kiln drying to 8-10% and the machining done well so the tongue and groove fit together nice and snug To install the stylish and classy lacquered oak flooring in your home, get in touch with us. We would be happy to help you. 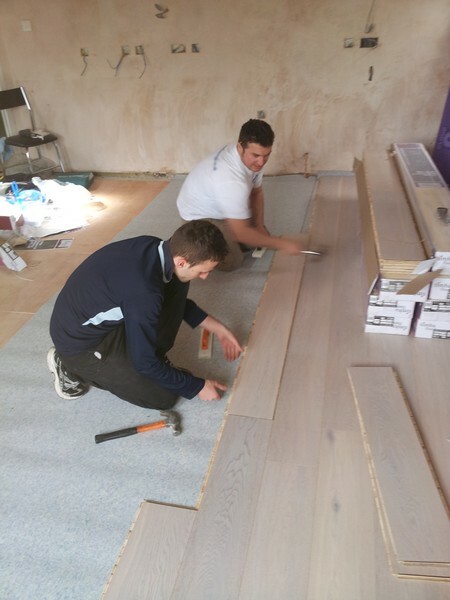 Woodflooring GB factory trained craftsmen offer a highly skilled and discrete service able to deal with most complex installations with minimum disruption leaving your floor ready for immediate use.